Imagine perfect peace and quiet. A quiet day outside isn’t quiet at all; even in the country you can hear wind and animals and other things around you. If you’re in a suburb or city you’ve probably never experienced true peace and quiet; in fact most people haven’t. An anechoic chamber is a room that is designed to absorb all sound within it, and let no sound in from the outside. There is literally no background noise. Chambers like these are also designed to absorb stray electromagnetic radiation, so they can be used for testing anything from cell phones to musical instruments. If you want to make sure you can hear exactly what you’re looking to hear and nothing else. That guy from the Verizon ads who’s with Sprint now would love it. Unlike most humans on the planet, I have actually been in a completely anechoic chamber, and over the years I’ve been in several partially anechoic chambers such as the ones you find in radio and recording studios. Going totally anechoic is an interesting experience. First of all, you might think that you wouldn’t be able to hear someone speaking to you, but that’s not true. You can hear just fine even if they are looking away from you. I actually found that to be a bit of a surprise. I thought someone’s voice would be significantly muffled if the person was talking in the other direction. You would think it was quiet, and it is at first. After a moment though you hear your breathing, the sound of your clothes moving, even the blood in your ears. After about 60 seconds it’s louder than most places you’ll go, and I have a feeling if I were there for 60 minutes I would think it was one of the loudest places I’d ever been, because all of a sudden I was hearing things I’d never heard before. However, it’s impossible to adequately explain what an anechoic chamber feels like. In fact, it was a bit of a surprise to find out that it felt like anything at all. Personally I was very at ease there, but it’s quite common for people to feel dizzy or ill at ease within one. Apparently humans are just not designed to deal with the lack of background noise. I will admit I felt slightly floaty, but not in an uncomfortable way. Putting aside the amusement inherent in going in an anechoic chamber, it’s actually a very useful thing. 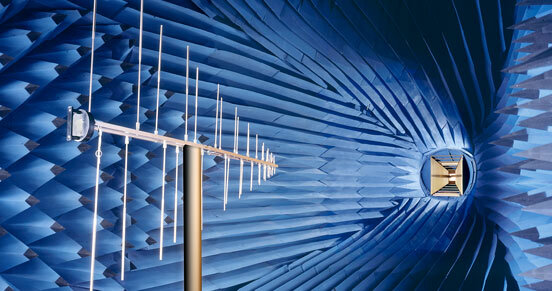 This kind of chamber, combined with some sort of signal generator, can test any kind of antenna with precision. It can determine if electromagnetic radiation is coming from any part it shouldn’t. The anechoic chamber is where you go to get cold, hard, facts. It makes me wish I had one in the antenna lab here in our West Coast offices. I did have this crazy urge to go up to the walls, which are made of foam cut in these crazy shapes like the picture above, and shout as loud as I could, but it was so quiet there I worried I’d give myself a headache.